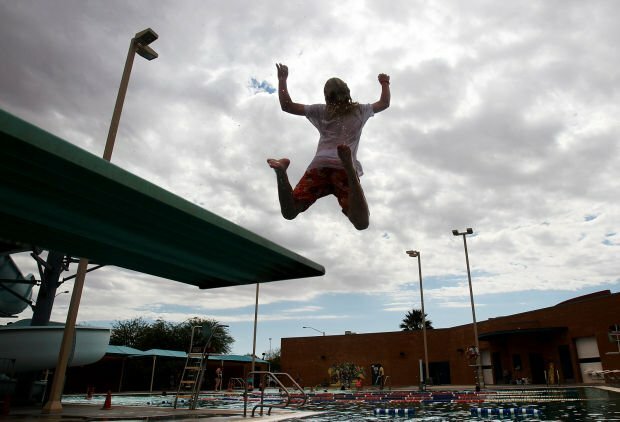 First day of Summer swimming at for Tucson city pools at Clements Center, 8155 E. Poinciana Drive on Thursday. From front to rear, Gigi Swiney, Rebecca Ripley, Suzi Berrie, Elizabeth Slick and Taylor Duran skate in a chain early on Saturday at Skate Country. 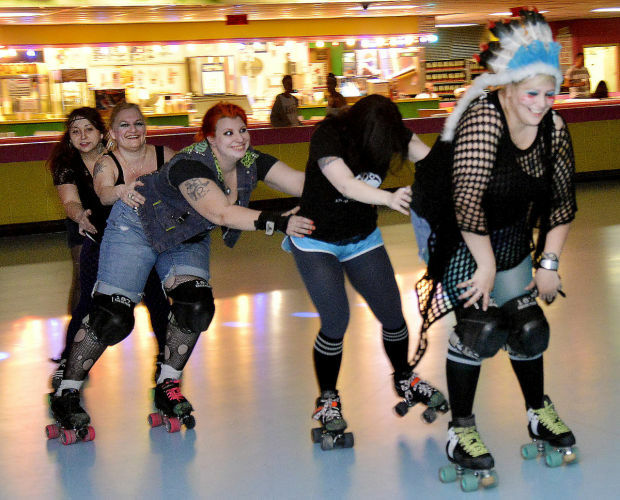 They are all members of a roller-derby team called Renegade Roller Girls of Tucson. Nico Montoya prepares to take to the track on the go-carts at Golf N' Stuff. This remodeled and expansive area featuring upgraded furniture and airy layout is the 101 space on the second floor in the Joel D. Valdez Main Library in Tucson, AZ. on Thursday, July 6, 2017. It is a room for teen ranging 13-18. It is a representation of the concept for redesigning the first floor children’s room. A $57,800 grant for the library’s children’s room will provide an early literacy space, imagination station, tween hangout zone and greater access to technology. Since the main library opened at its current location in 1990, the children’s area has never received any sort of substantial upgrade. A host of racers wind through the turns at Autobahn Indoor Speedway, 300 S. Toole Ave. in July 6, 2016. The indoor go-kart track is hosting a series of races. Whoever wins the races in Tucson will compete in the national championship in Chicago. Find a ball that fits your style or, if you bowl regularly, have one made to your personal specifications. This story was created by #ThisIsTucson and underwritten by Tucson Parks and Recreation, hiring now for summer jobs. Thank you for supporting the local organizations that support us! If you're struggling with ideas to keep your bored teens busy, we've got you. Sure, there's always the movies or the mall, but sometimes they need something a little different to do. From swim passes to cool teen gatherings at the library, you'll definitely find something for them to do on those slow days. If your teen is a desert fish, get them a Summer Swim Pass. They'll be able to spend as much time as they want at your local city pool. We bet you remember skating to your favorite music at Skate Country as a teen. It's still there and is still a fun, safe place for teens to hang out. When: Monday-Thursday, 3-6 p.m.; Friday, 3-5 p.m. Go here for weekend schedule. Tucson Games and Gadgets in Park Place mall has all sorts of game playing opportunities from Dungeons & Dragons to Star Wars X-Wing. On Saturdays you can go play board games. Either bring your own or play from the demo shelves in the store. If you have older teens, drop them off at Get Air for Club Air on Friday and Saturday nights. There will be awesome music, friends and lots of jumping. Of course, if you'd rather them not be out at night, you can always drop them off anytime during the day. We recommend Tuesdays because you can get two hours for the price of one. Where: Get Air Tucson, 330 S. Toole Ave.
You guys. The library has so many cool programs for people of all ages, even teens. For example, the downtown branch has its 101 Space, which is a space just for teens. It offers stuff like Maker Mondays where teens ages 12-18 can make weird things and improve their DIY skills while hanging out with friends. Where: Joel D. Valdez Main Library, 101 N. Stone Ave. They'll love the adrenaline rush of going up to 50 miles per hour on an indoor race track. Teens under the age of 18 can go without an adult as long as you send them with a signed waver and a copy of your driver's license. Where: Autobahn Indoor Speedway, 300 S. Toole Ave. When: Monday-Thursday, 11 a.m. to 10 p.m.; Friday, 11 a.m. to midnight; Saturday, 10 a.m. to midnight and Sunday, 10 a.m. to 10 p.m.
Give your teens $30 for a wristband and they'll be set for three hours of laser tag, miniature golf, bumper boats and go-kart racing at Funtasticks. There's also an arcade and a snack bar. When: Monday-Thursday, noon to 8 p.m.; Friday, noon to 11 p.m.; Saturday, 10 a.m. to 11 p.m. and Sunday, 10 a.m. to 8 p.m. Golf N' Stuff, on the east side, has a large arcade and batting cages on top of mini golf, bumper boats and laser tag. When: Monday-Wednesday, 10 a.m. to 9 p.m.; Thursday, 10 a.m. to 10 p.m.; Saturday and Sunday, 10 a.m. to midnight. Check here for ride hours and summer hours when school lets out. Cost: $20.70 for the "All Park Pass" which includes one round of mini golf, four attraction tickets and four arcade tokens. Single attractions start at $7.50. Batting cages are 20 pitches for $1. Bookmans has a free monthly studio night where people of all ages learn to paint. Instruction and supplies are included. At this month's event painters will create an extraterrestrial masterpiece. Keep an eye on Bookmans' event calendar. They do a lot of free events from game nights to art nights and everything in between. When: Friday, March 29, 6-8 p.m.
Info: Go here. Email eastevents@bookmans.com to RSVP. Sign your kids up for the Kids Bowl Free program. It's good for children ages 2-18. They'll get two free games a day during the week at participating bowling centers. Participating centers include Fiesta Lanes, 501 W. River Road; Lucky Strike, 4015 E. Speedway; Tucson Bowl, 7020 E. 21st Street and Cactus Bowl, 3665 S. 16th Ave.
Splash pads are opening and temps are supposed to climb to the 90s next week, which means we're already dipping our toes into summer.